There was a new-to-us nurse on duty at the hospice today, and it turned out that she is a friend of one of FL’s golf buddies. I suspect she is always… what shall we say… ebullient? She certainly took a lively interest in FL and I today. She decided that I was going to be her apprentice and she was going to teach me how to give FL a bed bath. He winced and closed his eyes. There was no escape for either of us. I have new skills, people! I am not sure she picked the best day for her lesson, however, as he had just finished telling me that he didn’t think he would still be alive the next morning: “I am dying,” he explained. So all the time we were washing him I could not get it out of my head that we were dressing his body ready for the wake. Overnight, they had given him a new gadget to try to prevent nappy rash. They call it a Uro-dome, which sounds like a sporting venue, but is actually a sort of condom attached to a collection bag. He didn’t know it was there and his face was a picture when I queried his lack of underpants and he took a perplexed peek under the sheet…! After his wash, he wanted rid of the thing and I can’t say I blame him. Nice try, but… no. He was awake more today than yesterday, and was managing to sip iced water through a straw. But he has stopped taking paracetamol as it makes him sick. The only drug he is taking now is Hydromorphone, the big painkiller. 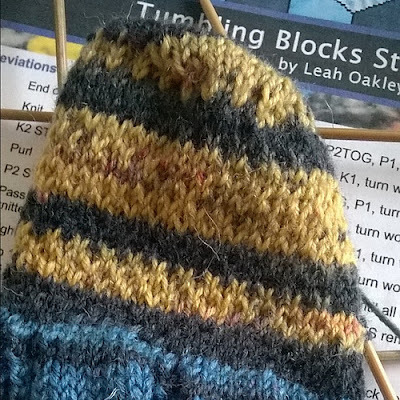 Today I worked on my Tumbling Blocks striped sock (pattern by Leah Oakley). The heel flap has a lovely Ribbed Diamond texture. I showed him my new hat, but he wasn’t in the mood for nonsense. Still, he smiled and waved when I left.